Matthew Lie-Paehlke is a PhD student in Urban Planning at the University of Toronto. You don’t always have time to keep up with the overwhelming amount of climate change and climate action news — so we’re starting a newsletter. Key climate change news from the realms of science, policy and activism — with a focus on actionable information rather than doom and gloom scenarios. We started a Youtube channel and Matt is learning to use video editing software. So far we’ve posted a climate action compilation, a video recap of an Extinction Rebellion event in Toronto that we attended, some AMAZING deputations about Toronto’s climate plan and one video featuring kittens explaining the climate crisis. In the future, we intend to put up videos of our Low-Carbon Luxury blog series, more protest recaps and short informational videos (maybe with more kittens). We’ve been working with MobilizeTO to build a plan to get a climate emergency motion passed in Toronto (similar to the one in Vancouver). We have a plan, but we have no money, so we need people power — and that means you. The first phase of the plan is to find one councillor willing to write and champion a climate emergency motion. The second phase is querying every councillor to find out if they support that motion and recording their responses. The third phase is getting out in the streets in the Wards of councillors who won’t commit to build support and get people to pressure them to act. Right now, we’re on Phase One. I know a lot of people have already contacted their councillors, but so far, no councillor has stepped up and drafted a motion. So we need you to contact your councillor and keep contacting them until they give you an answer. Find your councillor here: https://www.toronto.ca/city-government/council/members-of-council/. Going in person is best. Phone calls are second best. Emails are useful, but the easiest to ignore. If you call we have talking points here. If you email, you can use the template below. But please personalize it with your own feelings about climate change and your voting history or intentions in the next municipal election. Let us (or MobilizeTO) know by email (contact[AT]climatepledgecollective.org) or in this Facebook group if you get a response. I am writing regarding the Climate Emergency motion that passed recently in both Halifax and Vancouver. A climate emergency has also been declared in London England and dozens of cities in the US, the UK and Australia. These motions typically connect a public declaration of emergency with new oversight and ambition in existing climate plans. In our case, it would be an excellent opportunity to put TransformTO back on the agenda, get it the funding it deserves and increase its ambition by having city staff research a path to make Toronto net-zero by 2025. Please let me know as soon as possible if this is a motion you would be interested in submitting or supporting. There is a lot of energy building around this issue and many of us are trying to get a sense of where our councillors stand on this issue. I will follow up if I don’t hear from you within a week. Once we have a champion, we will post more about where individual councillors stand on the motion and our plans to get out and sign-up more supporters. Protests are great for getting attention and building connections, but we need concrete actions ASAP — so Climate Pledge Collection is always working to turn attention into actions both big and small. At yesterday’s Fridaysforfuture at Queen’s Park, we tried a poster-size version of our pledge system with prizes, surprises and noises — carnival style. The best thing about this approach is that it is easy to replicate. A few simple, but significant, challenges. A poster board and a marker. A way to make some noise and get attention. Resources to make it easy for people to complete your challenges. Think of things that people can do to help build the climate action movement. You could ask them to reduce their own footprint. You could ask them to put up posters or hand out pamphlets in their school or at a local church or library. The pledge sheets were – surprisingly to me – the most popular, but that might be because they were the ones that came with a cupcake. Yum! Calling elected reps was the least popular — which is too bad, because it’s important. People may be nervous about talking to a politician — but there’s nothing to be afraid of. If you stumble, you will have a bigger impact because the office manager will hear your honesty and recognize that you are an ordinary citizen who is worried about the future, rather than some polished, professional lobbyist. 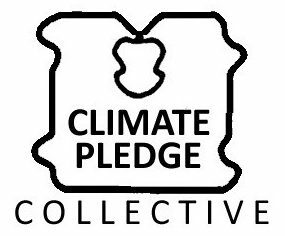 We didn’t get as many pledges as we hoped yesterday, but failing fast and often and then reiterating is what we’re all about at Climate Pledge Collective. Our mistake was not asking for time in the schedule. There was a full program of speeches and songs at the event, so we didn’t have much time to talk to people. But the ten or fifteen minutes before the speeches showed us that we have the right idea. Especially for engaging passers-by. Next time, I think I will also replace following social media accounts with asking people to share one of Greta Thunberg’s speeches on social media. Not much to explain here. We made a big poster, wrote the pledges on them and then tallied up who took up the challenges. We used foam core for the poster and brought an easel to keep it from tipping over or blowing away. Or you could just tape it to a wall. Luckily for this project, I have an ornate conch which I bought in China 15 years ago, before I stopped flying. Because it’s unusual, it doubled as a prize. You could use any kind of instrument, a boom box, a chant. Juggling, dancing, magic tricks. The goal here is to get people’s attention and gather a bit of a crowd. People seem more inclined to participate when there’s a crowd. If they walk past one by one, they’ll pretend they didn’t see you. For whatever reason — perhaps because we are so used to shopping — having prizes makes people think through the exchange and realize how easy the challenges actually are. We offered high-fives, hugs, a chance to sound the magic conch and vegan cupcakes with peanut butter icing. Recipes for both are down below. We also handed out Pledge Sheets and pointed people to our online pledge system. I noticed that the challenges where we could hand something out were the ones people were interested in. Next time, I will also prepare sheets with facts and talking points to help people out on their calls to elected representatives. Hopefully we’ll get a few more people pledging to call their reps.
One of the young speakers yesterday said that after the event was done, she needed all of us to go home and do more: plan more events, contact politicians, change our lifestyles. I like to think that a lot of people heeded her call, because she needs their help, but I worry they may not. People tend to act when prompted by phone calls or coupons or items in their schedule, so it is important to give people specific tasks if you want to call them to action. You can give them choices of course: put a poster in their hand and tell them to choose where to put it up. If you try any of this out, get in touch with us on twitter and let us know how it went! Preheat oven to 350 degrees F. Line a standard size muffin tin with cupcake liners. *You may want to lightly spray top of muffin tin with non-stick cooking spray to prevent sticking. In a large bowl mix all of the dry ingredients (flour, cocoa, sugar, baking soda and salt), mix well. Next, make 3 depressions in dry ingredients – two small, one larger. Pour vinegar in one depression, vanilla in the other and the vegetable oil in third larger depression. Pour water over all. Mix well until smooth. Fill each cupcake liner 3/4 full with batter. Place on middle rack of oven and bake for 15 to 20 minutes. Be sure to check cupcakes with a toothpick in the center to make sure it comes out clean. Each oven bakes at different rates, adjust baking times accordingly. When ready, remove from oven, allow to cool for a minute or two then remove from tin and place on cooling rack. When cooled, top with your favorite frosting or dust with powdered sugar. Enjoy! Recipe makes 12 standard size cupcakes. Whisk or blend together using a mixer all of the ingredients until smooth and creamy, adding more or less soy milk to achieve the desired consistency. Careful, though, as you don’t want to add extra soy milk too soon, and add just a 1/2 teaspoon or so at a time, otherwise you run the risk of your frosting getting too thin and runny. Also, you might want to stick the peanut butter in the microwave for about 10-15 seconds or so, in order to make it easier to work with. The fifth tenet of low-carbon luxury is meaning. Low-carbon luxury asks us to pursue meaning directly, instead of chasing after second-hand meanings in consumer goods. What does it mean to pursue meaning directly? First of all, you must be on the look out for meaning, you must notice when you feel fulfilled. It does not mean completing tasks that you think you ‘ought’ to do with no real sense of why. It does not mean pursuing fleeting pleasures. Meaningful experiences can be pleasurable and pleasurable experiences can be meaningful, but they are not the same. Which moments make life meaningful? This is a terrifying question because we worry that we will not find an answer. But ignoring this question fuels compulsive consumption and propels our pursuit of distraction. The first thing to realize about meaning is that it is not a stable substance. You might set your sights on some lofty career goal and arrive there only to feel miserable. Meaning is more like a chemical reaction — we can predict many of the ingredients, but a certain magic of temperature and fluid dynamics is necessary to make it coalesce. Meaning is itself a metaphor or a rhyme, the resonance of a moment that seals its value for all time. Real meaning courses through your mind and body and makes you feel more human, more certain of your identity. Sometimes you get it spending time with family or looking at the sky or reading a perfect poem or smelling a simmering stew. But you could also do all those same things and feel nothing at all. We must cultivate meaning. We must create the right conditions. We must water and fertilize and find the right balance of sun and shade. This is similar to being mindful, but it is more than that: it means planning your activities so that meaning will blossom. It might mean making sure you have a few moments to yourself before your children get up to ensure that you are in the right frame of mind to revel in their energy. It means putting in the time to get really good at something, even if it is difficult. It might mean striking up a conversation with a stranger even if it feels awkward. It also means not overdoing it — sometimes we overindulge in things we love until we dull our senses. We know when we have played too many video games or spent too many hours working — we feel grouchy and the activity we were engaged in has become a barren desert bereft of the meaning that was there only an hour before. Pursuing meaning directly sometimes requires self-care — we need our mental and spiritual apparatus to be in good shape in order to cultivate meaning. Our frantic modern economy always wants us on our feet, eating at our desk, putting in more hours — but meaning wants the opposite. Meaning favours those who dawdle. Meaning favours those who sit and soak things in. Meaning favours those who savour. Rituals help us remember to pay attention. They draw together similar events along with all their evocations and connotations, layering a new event with old memories. Creating personal or family rituals is one of the best ways of cultivating meaning. A ritual sanctifies time. For a moment, a ritual can focus the whole light of the cosmos onto a single activity. Consider the practice of confession. People constantly ruminate on their shortcomings, but they do so half-heartedly, they distract themselves from those painful thoughts as soon as they arise. Confession is a ritual designed to set aside a time and space for confronting our failures. The penitent confronts what they have done and accepts it. They allow themselves to feel the fullness of their sorrow and regret. And then they receive absolution and they move on. By doing just one thing, by doing it with intention and a compelling rhythm, confession allows a person to take an activity that tends to run in the background and move it to centre stage where it can reach a meaningful conclusion. A ritual has a name, it has a familiar pattern, and it takes an ordinary activity and elevates it above its surroundings. A ritual is like a habit, but it has been designed with a purpose in mind. When I was in the fourth grade, my parents got divorced. My father moved into a new house. My parents were miraculously calm and compassionate during the divorce, but going home from school to a new house, where all those familiar layers of emotion and memory were missing, was still strange and unsettling. One thing that helped me connect to this new world was a modest family ritual. About once a week, my father, my younger brother and I would walk to the convenience store together, choose a treat and eat it on the walk back. But there were two convenience stores to choose from, one was a little closer and one was a little farther. In general, we went to the closer one. So we started to call it the “usually store.” I believe it was my younger brother – who still used language with the slapdash ingenuity of a novice — who coined the term, but my father and I adopted it intentionally, sanctifying it through repetition. The farther store became the ‘unusually store.’ Giving the two stores nicknames made them special and that aura of significance carried over to the entire practice of walking, perusing, choosing and chewing. Because we did the same thing so often, and because it had a name, it felt comfortable and fulfilling. You might wonder why a blog series about reducing consumption would speak so glowingly of a family shopping outing. It is a story about consumption, but it is modest, appreciative consumption. All of us consume. But how much we consume rarely correlates with how satisfied we feel. When we are distracted, we can gobble up a whole chocolate bar without noticing – but if we make a ritual of it, we can be satisfied with a tiny sliver.² Imagine yourself carefully unfolding the golden wrapper that protects a bar of fine chocolate. You break off a single piece, put it on your favourite plate and carry it over to an armchair. You sit down. You arrange yourself in your seat. You take a few deep breaths. Your favourite music is playing. You place the chocolate on your tongue, close your lips and allow it to slowly melt in the warm hollow of your mouth. Here’s a modest ritual I invented for my daughter: Each night, before I go to sleep, I fill our coffee maker so I won’t have to do it in the morning. After I make the coffee, I do one last thing before I go to sleep. Each night, I hide a little Waldo figurine from my childhood somewhere in our house and each morning, while I’m waiting for the coffee to percolate, my daughter goes hunting. Sometimes Waldo is on a bookshelf camouflaged by a red and white picture book. Sometimes he bravely ascends up into a light fixture. On other days, Waldo ventures into a potted plant or gets trapped in a jar of marbles. Sometimes he is completely out of sight, waiting to surprise my daughter when she unzips her backpack. Waldo is a chunk of plastic, an eminently forgettable commodity – but how my daughter and I have chosen to use him makes him shiny and new every single morning. How often do we try to shake up our routines by buying something new? Using an old thing in a new way often does a better job of delivering the invigorating dose of novelty that we are seeking. Applying a little creativity to the endeavour also makes the ritual more personal than a store-bought pleasure could ever be. We spend a lot of time thinking about what we will buy, how we will pay for it, whether we ought to get it delivered or not, but we spend relatively little time planning how we will use the things we already have. Which overlooked moments could you turn into enriching little rituals? A morning coffee. A walk with your dog. A weekly lunch. You may already have personal rituals that make your life more meaningful. But naming them and taking them seriously as rituals can make them even more fulfilling. The most important part is to remind yourself that these activities are special so that you pay close attention. Name it. The name can be vague or playful or grandiose. I’m sorry, I can’t hear you, this is ‘Mama’s Moment of Chocolate.’ When we identify something as a ritual, the different occurrences on different days echo and amplify one another, creating an activity that gets richer and richer with time. Make sure that some aspect of your ritual is consistent and distinct from the rest of your daily rhythm. Maybe you have your morning coffee on the porch. Maybe you have a special hat for gardening. Maybe you always put your piece of chocolate on the same little saucer that you inherited from your grandmother. Using special objects, doing things in special places – these practices can remind your body that this activity is significant. Be yourself. Examine how you feel while you are participating in your little moment and adjust the details until your ritual is as unusual as you are. I like whimsy and surprise – so hiding Waldo and imagining him peering out with his little binoculars is enjoyable for me. If you enjoy the feeling of carpet under your feet, take your shoes off during your coffee break at the office. Use all your senses. Don’t just drink your coffee: smell it, cradle the warm mug in the palm of your hand. Turn off the radio and the fan and enjoy the silence. Choose the rituals that work for you! Last night, on New Year’s Eve, my wife and I went to sleep at eleven. We missed the party, but we slept deeply and met the New Year calm, quiet souls and the type of fine-grained sensitivity born of stillness. The sensitivity didn’t kick in until after we had our coffee — but it’s mostly working out. This isn’t to say that you shouldn’t go out and enjoy the flash and bang and revelry — because there are rich meanings to be had in crowded nocturnal gatherings as well — only that you have to be intentional. Make sure you are pursuing the meanings you value most, rather than playing a supporting role in someone else’s ritual. We can also create mini-rituals to help us focus on what we are doing. Closing your eyes, pressing two fingers to your forehead and taking a deep breath before re-opening your eyes and re-engaging with your surroundings can make a world of difference. When we go out to a restaurant, my wife closes her eyes and imagines herself eating different items on the menu before she places her order, when the food arrives at the table, she picks up her plate and smells her meal before she disturbs it with her cutlery. Not everything can be a ritual — that would become exhausting in its own way – but building a few special moments into each day can turn a week that seems to rush past in a blur of errands into a string of jewels. Not only is this ritual easy and delightful, it helps us train our minds to be grateful for good experiences instead of spending all our time reliving the bad ones. The best thing about intentional rituals is that – unlike compulsive behaviours – they get better and more enjoyable each time you repeat them. Human culture is itself a tapestry of rituals, a rich set of practices designted to intensify and accentuate our experiences. And while culture has a material foundation, its richness is not reliant on its materiality — we make music with our lungs, take books out of the library, write poetry, pass down family recipes — and all this added beauty, all this cultural wealth needs very little material footprint to maintain itself. Though culture sometimes revels in materiality, information wants to be free. This idea is based on my life experience. But it also has significant scholarly support. For example, Nobel-prize winning psychologist Daniel Kahneman (2011) writes “To get pleasure from eating, for example, you must notice it. We found that French and American women spent about the same amount of time eating, but for Frenchwomen, eating was twice as likely to be focal as it was for American women. The Americans were far more prone to combine eating with other activities, and their pleasure from eating was correspondingly diluted.” (395) Kahneman, D.,. (2011). Thinking, fast and slow. Toronto : Doubleday Canada.